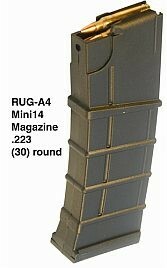 These 30 round magazines are constructed of DuPont Zytel and are considerd nearly indestructible. These magazines are of the same mold and design as the Thermold magazines. Fits in most web gear and competition mag holders. And best of all they're WARRANTED for Life! Restrictions are observed in the following cities and/or states prohibiting the sale or shipment of magazines with more than a 10rd capacity to: Aurora, Il; Chicago, Il; Cook County, Il; Cincinnati, OH; Columbus, OH; Toledo, OH; South Bend, IN; All of CA; All of CT; All of HI; All of MA; All of NJ; All of NY The sale or shipment of magazines with more than a 20rd capacity is restricted to the entire state of Maryland.